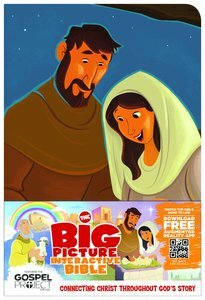 About "HCSB the Big Picture Interactive Bible For Kids Jesus Leathertouch"
Together kids and parents can enjoy the Christ Connections and Big Questions and Answers call outs that show God's story unfolding from the beginning of time and how we fit into his plan. This meets children in the visual world they are so accustomed to, bringing Bible pages to life. Over 400,000 individual participants, 40,000 plus groups, and 7,000 plus churches have already started their journey with LifeWay's "Gospel Project," making this the perfect companion for the "Gospel Project for Kids" curriculum. This is part of the Big Picture brand, which includes "The Big Picture Interactive Bible Storybook," "The Big Picture of What God Has Always Wanted," and "The Big Picture: Making God the Main Focus in Your Life." Augmented reality narrations by Jenna Lucado.